« What Metals Are Worth Recycling? Scrapping a car is a big decision, so it’s little surprise that a lot of people put it off… and off… and end up waiting too long. With the rules on keeping a car off-road getting increasingly strict, it’s more important than ever to act promptly when you decide you need to scrap your car. And after the harsh winter, it is the best time to spot a motor that’s all but clapped out, as the harsher weather and road conditions give you a chance to pin down any long-term faults that just aren’t worth repairing. Repair work is one of the easiest decision-makers for you when it comes to scrapping your car, and that’s because it’s typically the most expensive part of owning a car – especially an old one that’s prone to breaking down. If you find yourself landed with a repair bill reaching into four figures, or close to that threshold, and you know you could buy a decent enough new car for £500-600, you have to question whether it’s worth having the work done. Scrap your old car and get a new one. It’s the most sensible decision economically, and it’ll make driving more pleasurable in the long run too. Sometimes it’s not that the car is really on its last legs; you just fall out of love with it. Maybe it’s that squeak behind the driver’s seat that’s finally started getting to you, or the way you have to let the engine turn over three or four times before it will start. Perfectly drivable cars get scrapped every day – and you could find by scrapping yours, you get more to put towards a deposit on a new car than if you took your old one in as part-exchange. It seems crazy to think anyone has a spare car just parked up and going nowhere, but a surprising number of us do – maybe a cast-off from a family member or a runaround that’s not really needed now the kids have left home. They just take up space, they’re often not the most beautiful of motors, and they can actually cause you a lot of money if you’re still taxing, testing and insuring them but never take them as far as the end of the drive. 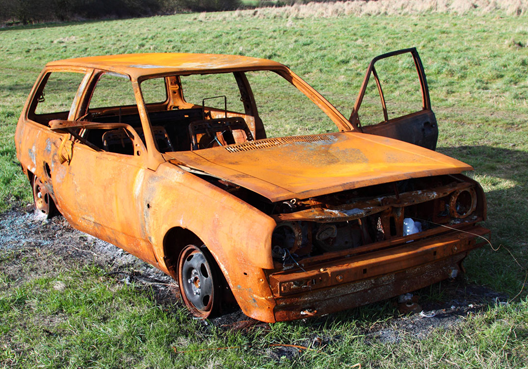 If you don’t drive it, scrap it – your driveway will look a lot nicer, and your bank balance should do too. For more information on scrapping your car call us on 0161 928 9981 or click here for your quick scrap car quote..
Like us on Facebook and follow us on Twitter for all the latest news.